Heavy Barrel is a scrolling shoot-em-up for one or two players, in which an army of terrorists have seized control of a nuclear missile facility. 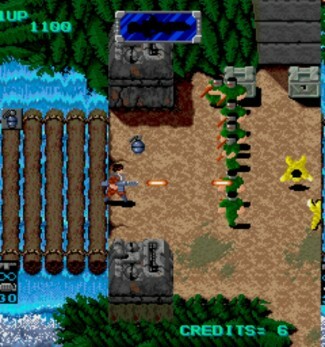 Players must infiltrate the heavily defended base and shoot their way through seven levels before reaching the final enemy Boss confrontation. As with SNK’s “Ikari” series, Heavy Barrel allows players to rotate their on-screen character and fire and move in all directions. Additional weapons and power-ups can be found, as well as keys which are used to open locked weapon containers that litter the levels. In addition to the standard in-game weapons, the “Heavy Barrel” gun of the game’s title also features. This must be assembled by collecting six different components (found in locked weapon containers). Once completed, the Heavy Barrel gives the player incredible firepower and instantly destroys anything it hits (with the exception of end-of-level bosses, which take several hits), although the Heavy Barrel only lasts for a period of thirty seconds, as indicated by a depleting red bar displayed at the top of the screen.